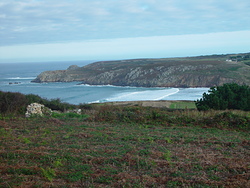 Baie des Trepasses in Brittany is a fairly exposed beach break that has quite reliable surf, although summer tends to be mostly flat. Works best in offshore winds from the southeast. Groundswells and windswells are equally likely and the ideal swell angle is from the southwest. Waves at the beach break both left and right. Best around low tide when the tide is rising. Rarely crowded here. Be wary of rips - they make surfing here dangerous. For Anse de Cabestan, 9 km from Baie des Trepasses. At Pointe Du Raz, 3 km from Baie des Trepasses. The two graphs above are also combined in the single Baie des Trepasses surf consistency graph. Also see Baie des Trepasses surf quality by season and Baie des Trepasses surf quality by month. 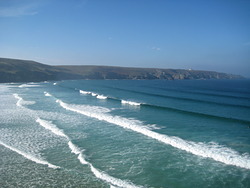 Compare Baie des Trepasses with another surf break. The closest passenger airport to Baie des Trepasses is Pluguffan (Quimper) Airport (UIP) in France, 41 km (25 miles) away (directly). The second nearest airport to Baie des Trepasses is Guipavas (Brest) Airport (BES), also in France, 49 km (30 miles) away. Third is Ploujean (Morlaix) Airport (MXN) in France, 90 km (56 miles) away. Lann Bihoue (Lorient) Airport (LRT) in France is 100 km (62 miles) away. Lannion Airport (LAI), also in France is the fifth nearest airport to Baie des Trepasses and is 120 km (75 miles) away. 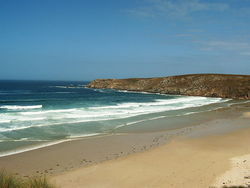 This is the Surf-Forecast page for Baie des Trepasses, Brittany - Finistere. Use the tab navigation above to view Baie des Trepasses sea temperature, Baie des Trepasses photographs, Baie des Trepasses detailed swell predictions, wind and weather forecasts, Baie des Trepasses webcams, current wind from Brittany - Finistere live weather stations and Baie des Trepasses tide predictions. 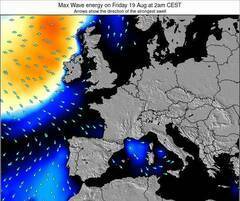 The France swell maps link will open up the big picture showing France and the surrounding seas. These swell maps can be animated to show the different swell components, wave energy, wave period, wave heights, together with wind and weather forecasts, current weather and sea state observations from France wave-buoys, passing ships and coastal weather stations. Each of the forecast pages for this surf break feature a global and regional wavefinder tool to locate the best surf conditions in the area around Baie des Trepasses.